From Tammy and the blog at She’s The First Have you read the best-selling book Give and Take by Adam Grant? The idea is that you drive your own success by helping others. This is something I see happen all the time to She’s the First volunteers, donors and partners. I’m proud to share a recent example. Around 10:30am, an envelope was dropped on my desk. I opened it, and inside was a $10,000 (£6,650) cheque from the Coach Foundation. Two months ago, the chief executive officer of Next Jump, Charlie Kim, informed us that his wife Ella, as a Coach employee, had the ability to nominate She’s the First for a donation. Coach focuses on funding education and women’s-related projects, so it was a perfect fit, but you could only win if an employee nominated you. This is a contribution we’d have never received if we weren’t part of the Next Jump family through #AdoptaNonprofit. Immediately after receiving it, I ran over to Francesca Ferrante’s desk, because as captain of #AdoptaNonprofit, she is always so proud in these moments. Francesca jumped at the chance to include this good news in the Buzz report at the weekly all-hands staff meeting at 12:30pm, which I attend as a representative of She’s the First. Little did we know that something else big was in store. 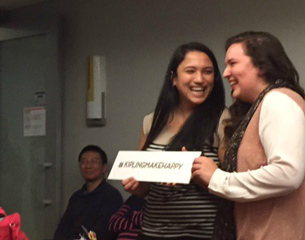 Charlie had a recap to give at the end of the meeting: last Wednesday, the brand ambassadors of Kipling, a fun backpack company, ambushed the office to honour Francesca as one of only three employees in New York City who ‘Make Happy’ in the workplace. ‘Make Happy’ was a contest for which I had nominated Francesca because she makes the whole staff feel more fulfilled coming to work each day by taking such good care of us in the #AdoptaNonprofit partnership. In addition to her actual job description, she goes the extra mile to bring Next Jump’s vision of changing the world alive. It literally took me less than five minutes to sing Francesca’s praises. I think I composed the email on my subway ride to work. We forget how easy it is to take that extra moment to throw someone’s name in the ring. Too often we see these contests and automatically think that so many people are entering, so there’s no use. But how will you know if you don’t try? Kipling ended up rewarding Francesca with a bunch of goodies and donated $500 to sponsor a She’s the First Scholar in Uganda in her name. They also invited her to a small private concert that night to enjoy drinks and appetisers with one of our STF staffers, Katie Riley. As Charlie was summarising this recognition in the Monday meeting, he wanted to do something more to recognise Francesca for being so selfless (sponsoring a She’s the First Scholar made Francesca — and us — super happy, but didn’t give her the chance to kick back and relax, like the other winners got to do in seeing Broadway shows, for example). Charlie cued music. Britney Spears started blasting over the speakers. Francesca would be going to see her music idol, Britney Spears, perform in Vegas in the VIP suite, along with three guests — all airfare and two nights in a hotel provided. Francesca was totally speechless.